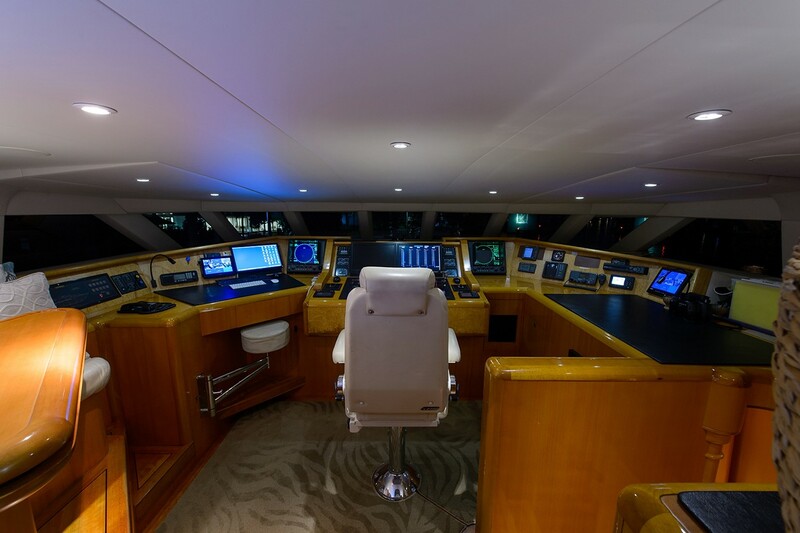 M/Y SAVANNAH is a 35,97m (118ft) motor yacht built in 2000 by Intermarine Savannah with interior styling by Luis De Basto. 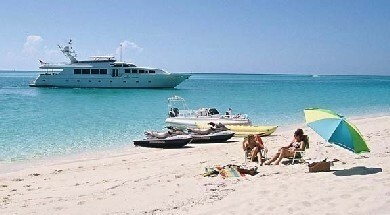 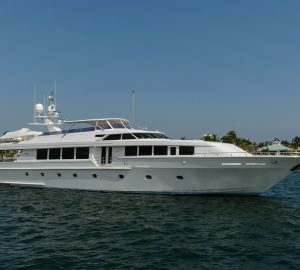 The yacht is available for charter and based between New England and the Bahamas. 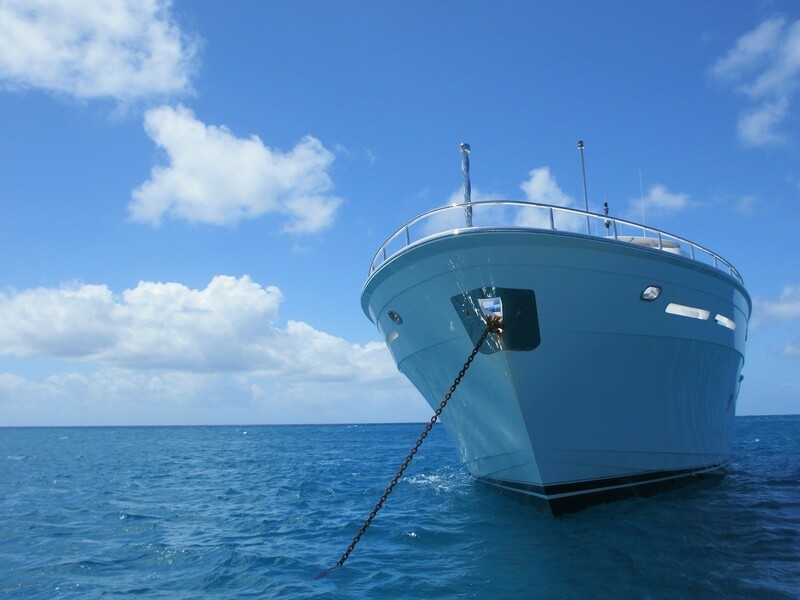 She underwent a refit in 2014. 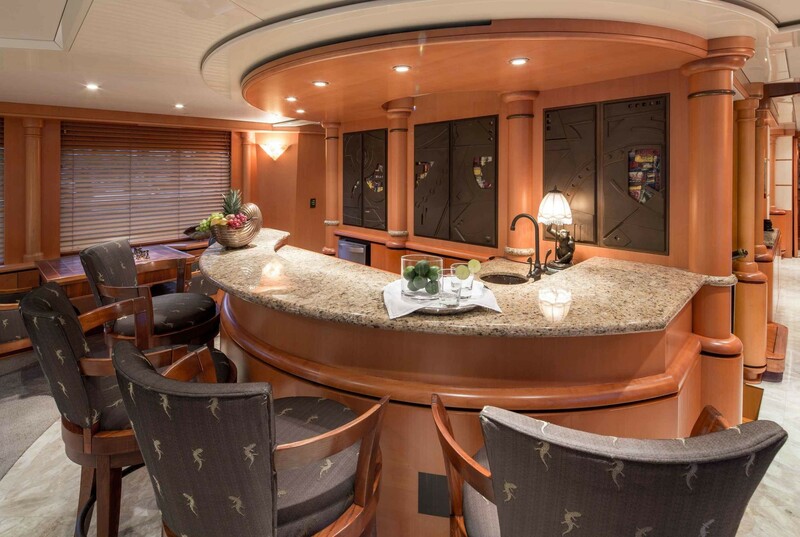 SAVANNAH can accommodate 8 charter guests in 4 staterooms. 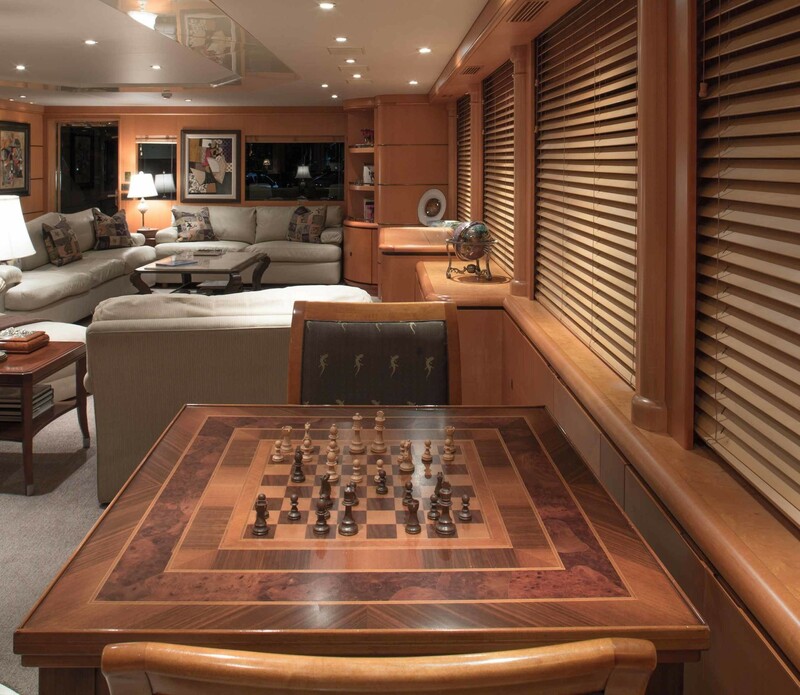 Her interior features classic European decor, which is tasteful, bright and casually elegant. 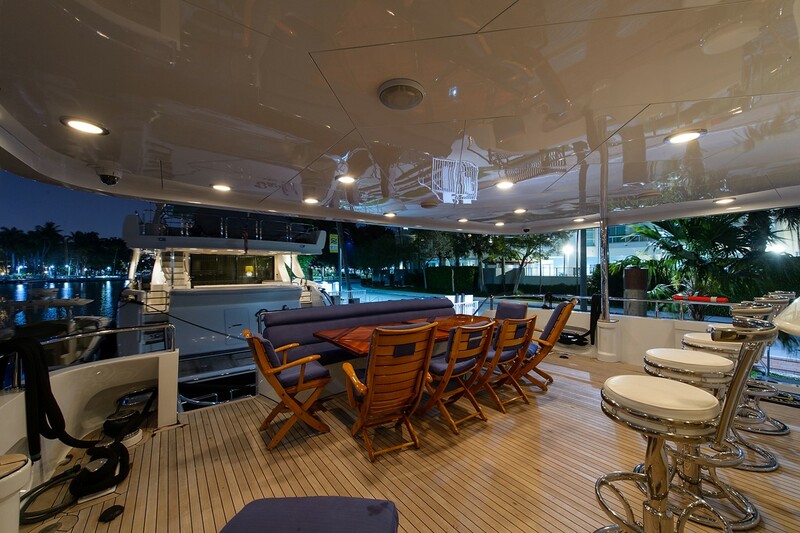 Outside, the yacht boasts ample deck space. 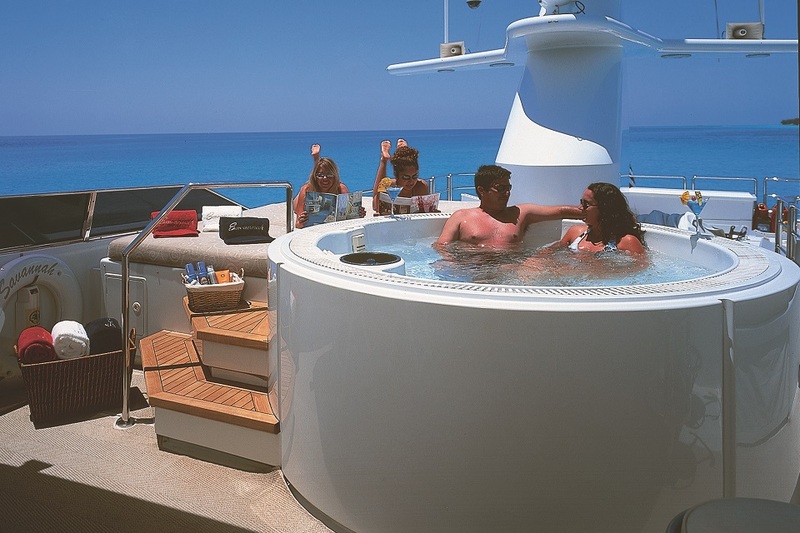 The flybridge boasts a roomy outdoor Spa Pool, with a firm cushion cover that becomes a sunbed with additional soft cushions around the Spa Pool, a full wet bar with bar stool seating for 4 and a JennAire Grill with space for Alfresco dining. 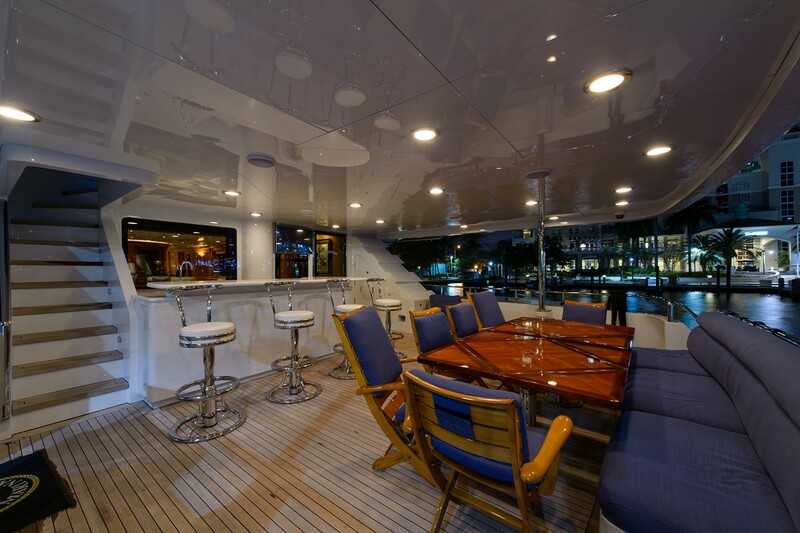 The Aft Deck is open but shaded with casual seating for 10, a full bar with bar stool seating for 4 and easy access to swim platform and water toys. 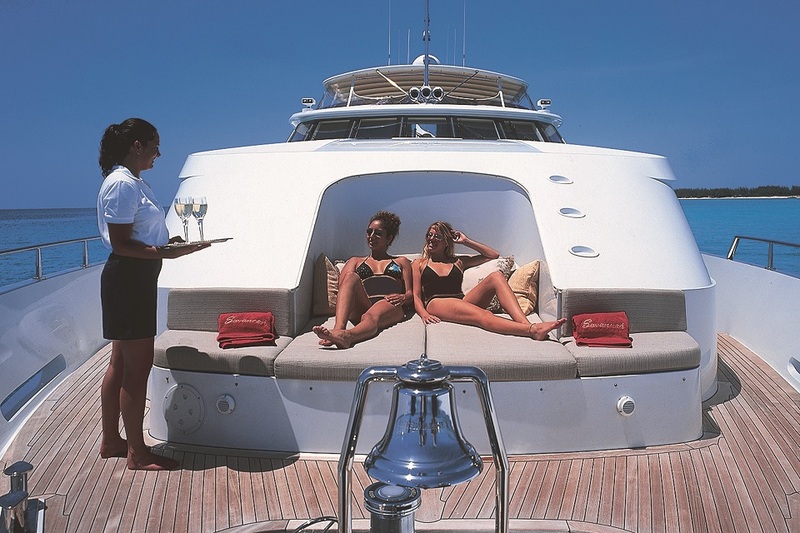 Forward of the yacht, there are some additional sun beds. 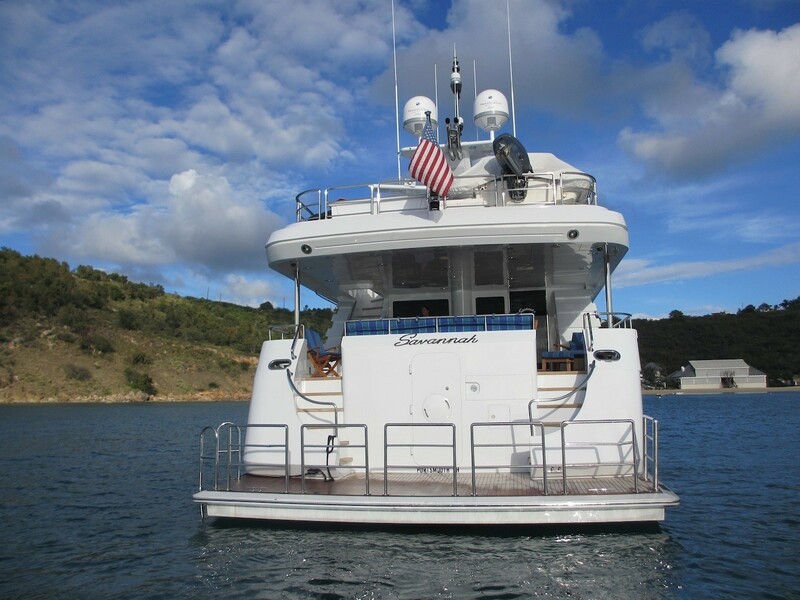 SAVANNAH is a well-equipped charter yacht with a vast array of water toys and a caring and professional crew of 6. 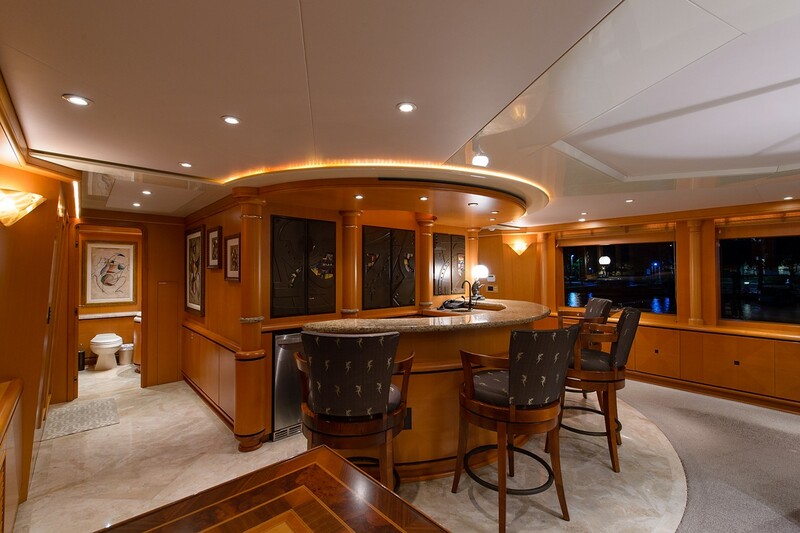 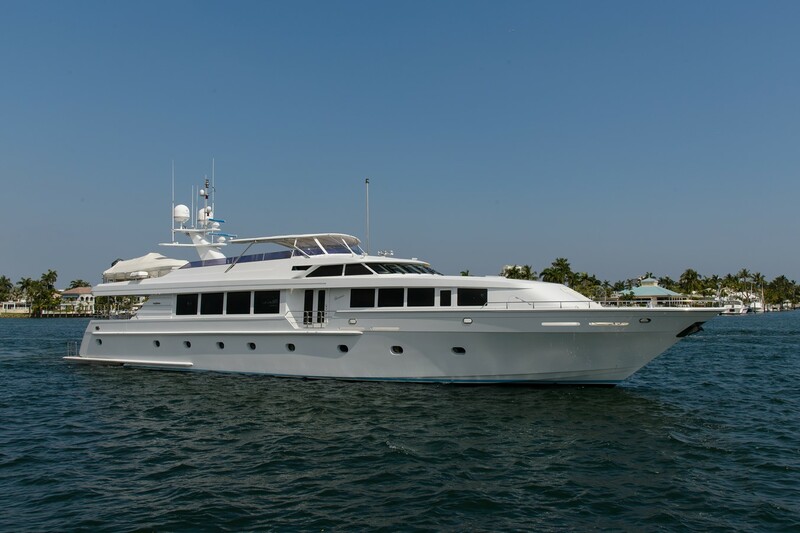 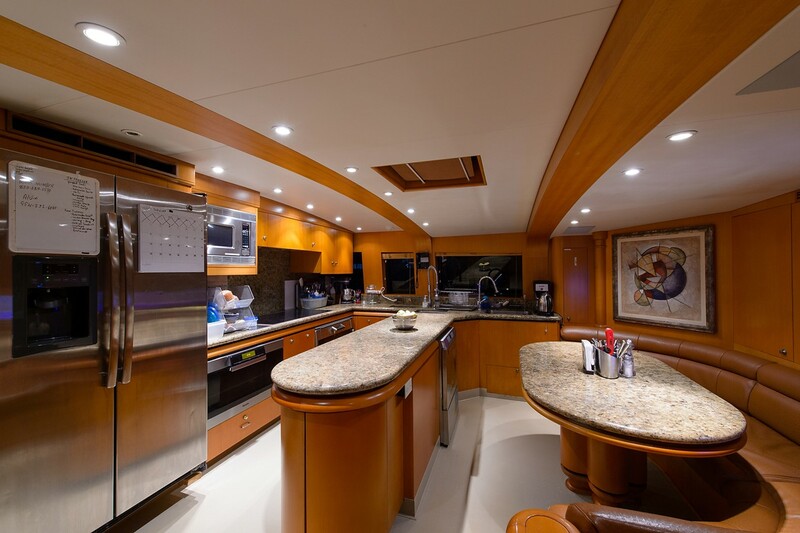 Motor yacht SAVANNAH can accommodate 8 guests in 4 individual staterooms. 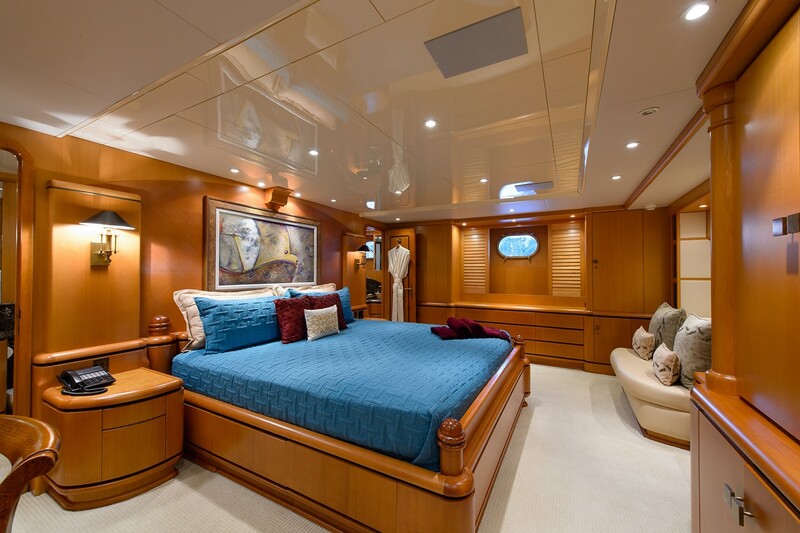 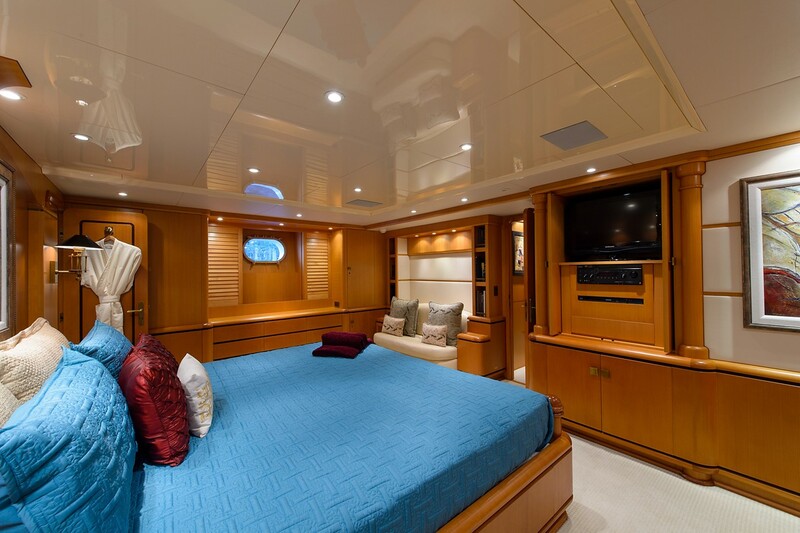 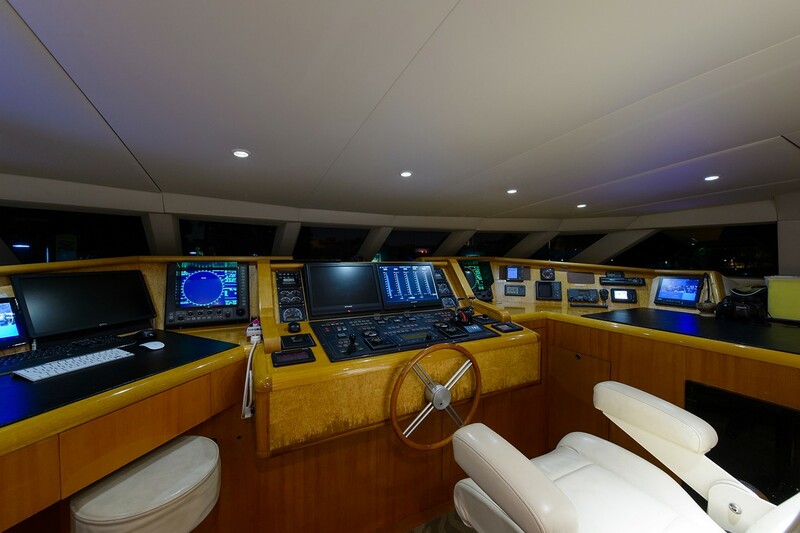 The Master suite is located below deck amidships and is full width of the beam. 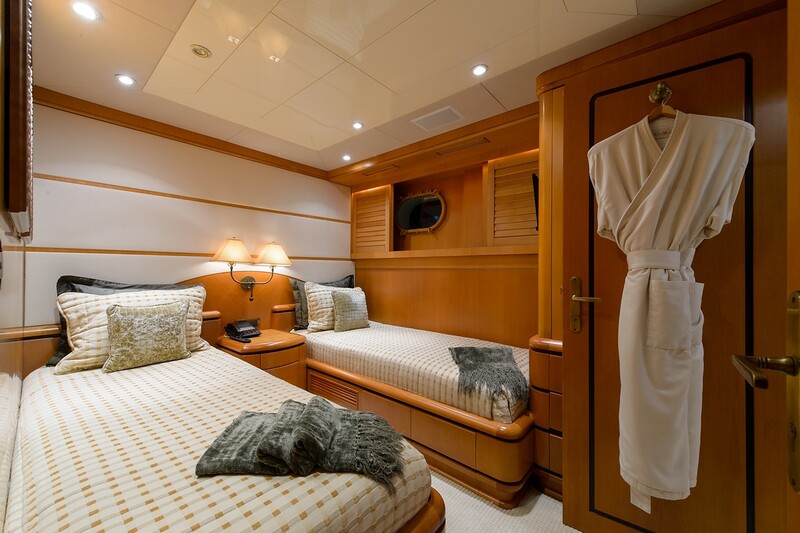 The cabin has a king bed and his and hers ensuite head with large Euro shower. 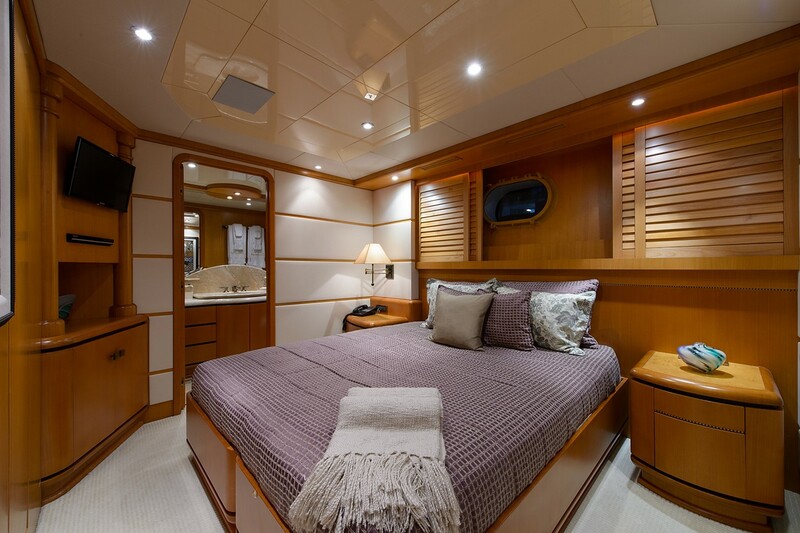 The VIP cabin has Queen sized bed and is located below deck to the port with ensuite head with shower. 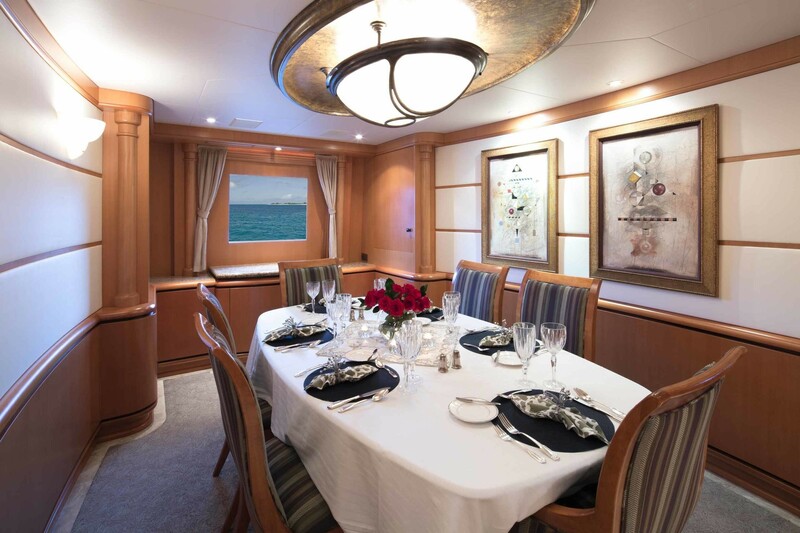 The Guest Queen stateroom is below deck aft port and can convert to twins beds if necessary and has an ensuite head with shower. 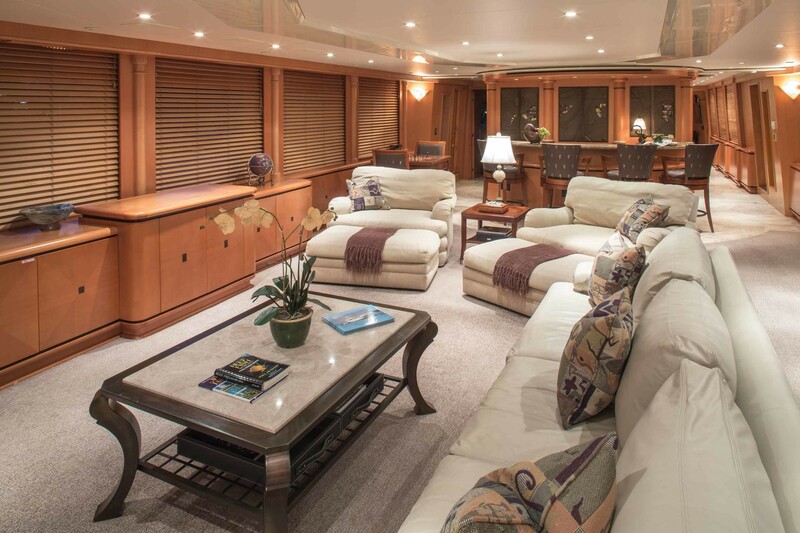 The final room is a Twin cabin and is below deck to the starboard. 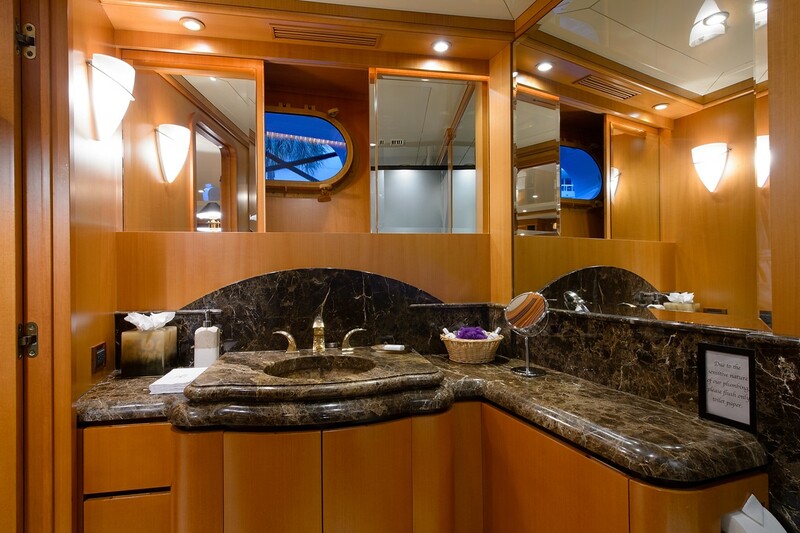 This cabin also has an ensuite head with shower. 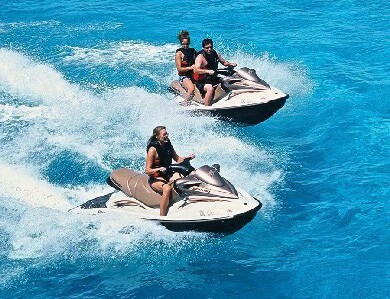 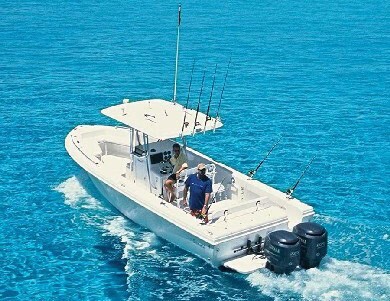 Tenders & Toys: ~28’ Bluewater w/(2) 225hp Yamaha outboards - Chartnav, Depth Sounder, VHF Radio, CD/AM-FM Stereo, live bait well and more ~19' Zodiac w/150hp Yamaha outboard ~2 x 2-person Yamaha wave runners ~waterskis ~2 x paddleboards ~tow tube ~fishing gear ~ample snorkel gear ~assorted beach toys Audio Visual Equipment and Deck Facilities: ~Total of 13 TV screens on board the yacht with independent Direct TV. 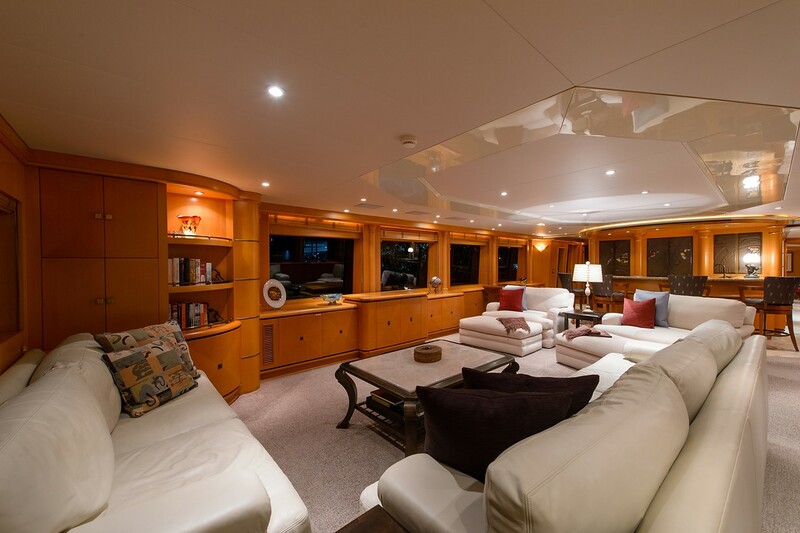 ~Sonos wireless sound system in Main Salon and aft deck for music, movies, and TV. 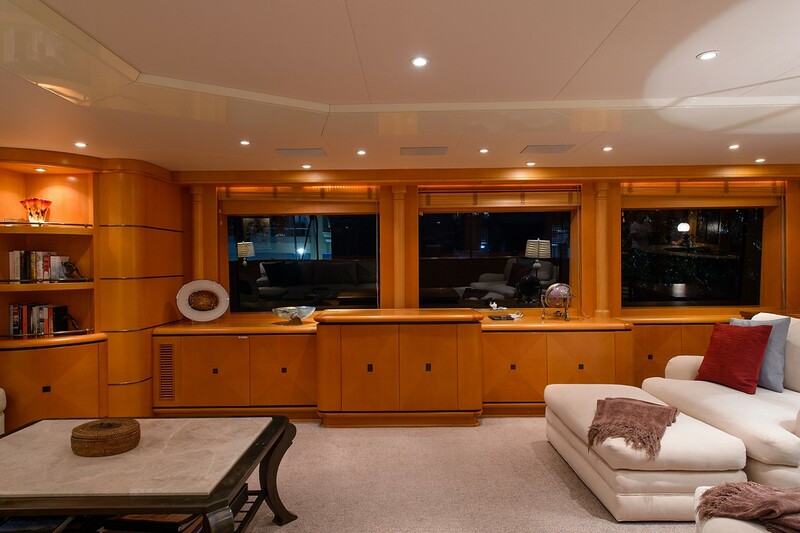 Surround Sound Stereo. 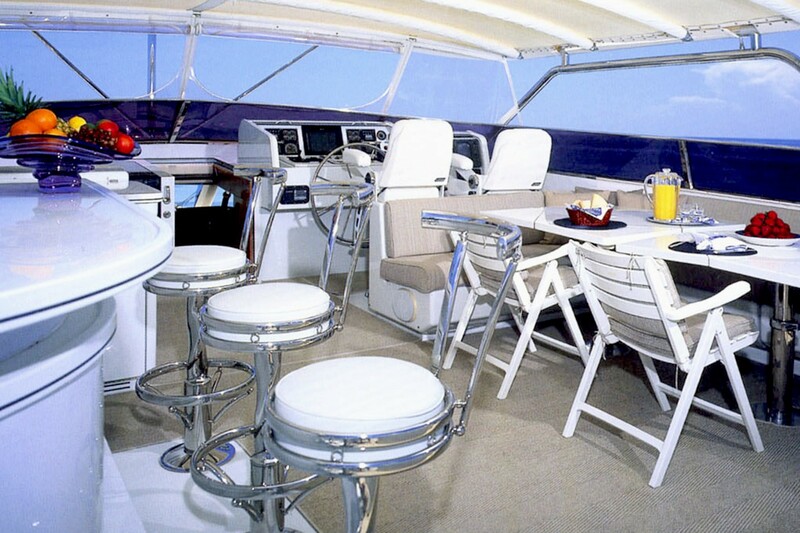 ~Surround Sound Stereo on Flybridge. 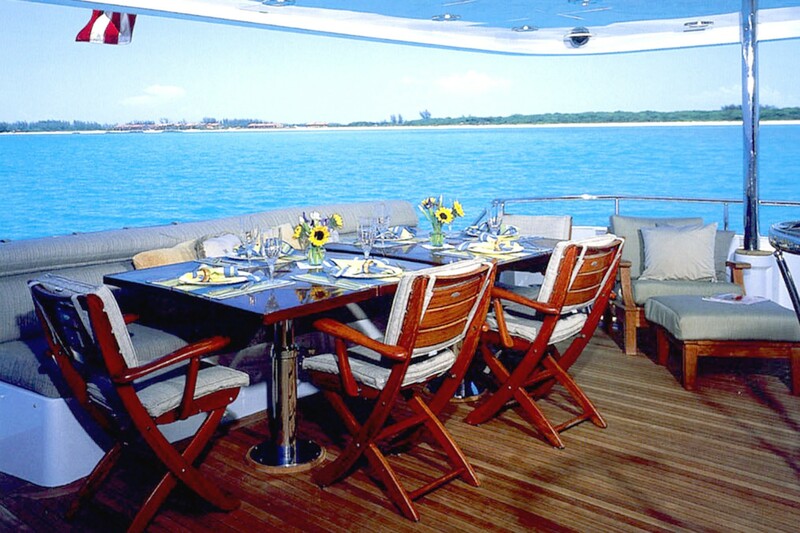 USB plug-in ~TV/DVD/VCR/CD/Am-fm Communications: VSAT, WIFI (Internet availability at all times) Skype phone system. 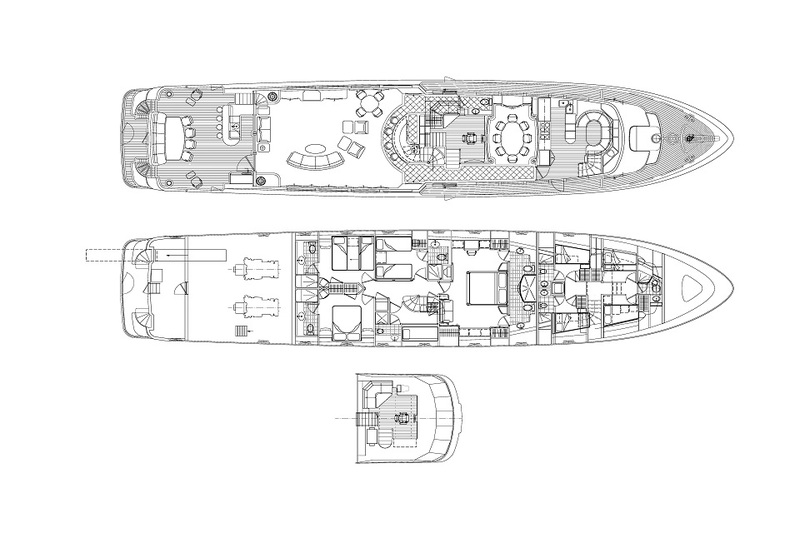 Integrated Cellular Phone, Fax Machine, VHF Radios, Inmarsat. 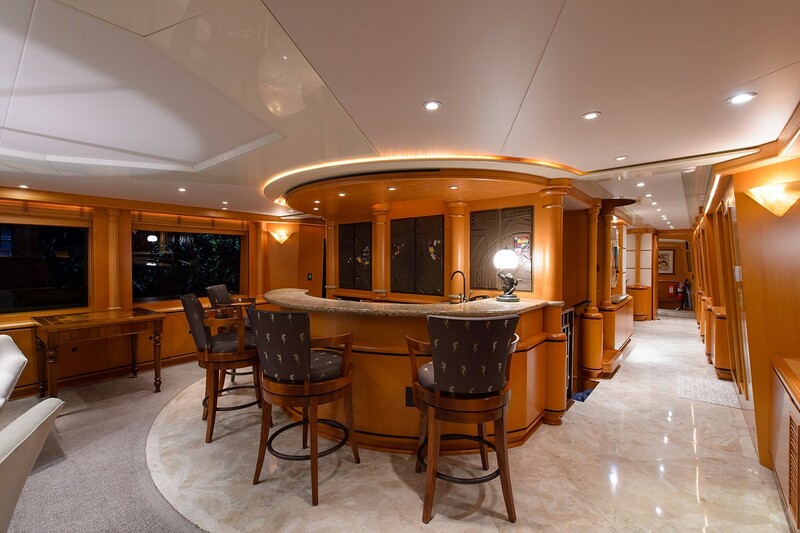 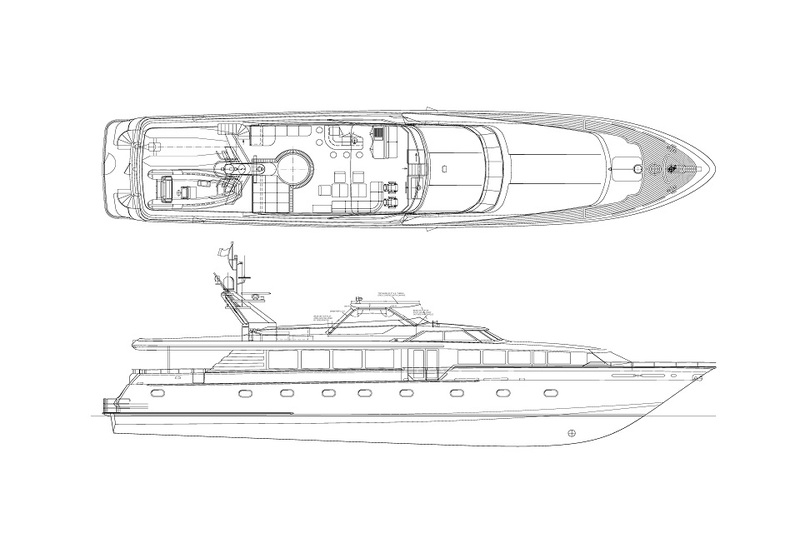 Intermarine - Luxury yachts built and launched in the USA.